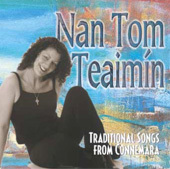 NAN TOM TEAIMIN DE BURCA: TRADITIONAL SONGS FROM CONNEMARA A native of the Carna area of Connemara, which is synonymous with traditional singing in Gaelic, and a winner of the famous O'Riada Cup in 1998 and 2000, Nan de Burca has one of the great sean-nos voices of the present generation. Here she has recorded 10 songs, two in English, "The Lambs on the Green Hills" and "James Connolly," and eight in Gaelic, the latter including some of the great classics of the genre like "Roisin Dubh," "Caislean Ui Neill," and "Na Paipeir a Saighneail." Complete lyrics in Irish and English translations are provided in the booklet.